Mike, Mikey, Ryan, and I went to breakfast at Bob Evans. 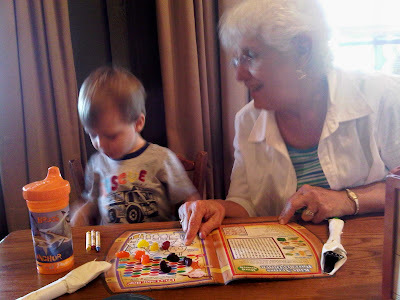 We then Met Grandma Lee at Grandpa's fire house. Oh my gosh, I get to try on Pa-pa's fire helmet! Mikey thought Grandpa's fire helmet was awesome, until he found out how heavy it was, so Daddy had to help him try it on. 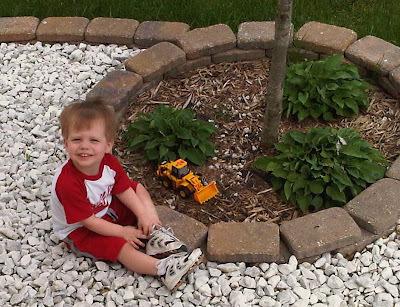 We then went to Grandma and grandpa Fortner's for an early dinner, and to play in the water. Dylan and Mikey...a pair of really cool dudes! Ryan was content to stay in doors, thank you! It was his first time in the Johnny-jump-up. Mikey had Dylan had a blast playing in the water. Spray me with the hose Daddy! Mikey was laughing really hard, and thought it would be funny to get as close to the hose as possible! Mikey then told Daddy he was done! Go in NOW? 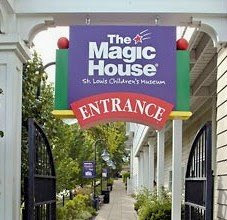 On Saturday Ryan, Mikey, and I met Grandma Lee at the Magic House in Kirkwood, MO. This is a chalk drawing, that had been drawn on the concrete the day before. Mikey like opening each door to the alphabet wall, guess which letter was his favorite? The letter "T," because it had a train inside! The bells were really fun! Mikey played with this exhibit for a long time because it had a tennis ball that rolled down, and rang each little bell as it passed by. Mikey rode the slide 10 times in a row! 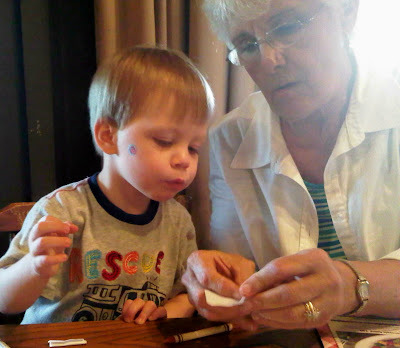 Tea party with Grandma! Would you like 1 lump of sugar or two? It was a great day at the Magic House. 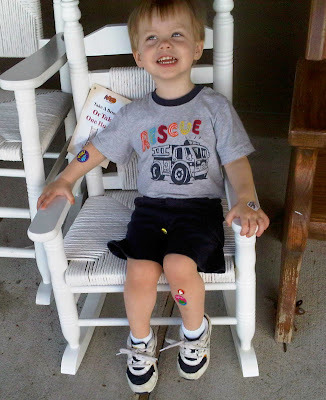 Mikey really had a good time...Mommy and Grandma were exhausted! Then we met Gi-gi for dinner. 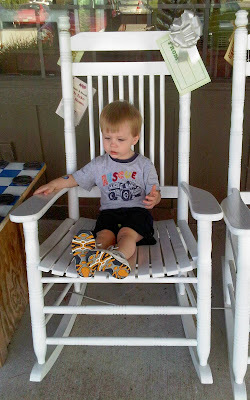 Look Gi-gi, this rocking chair is my size! This one is to big! 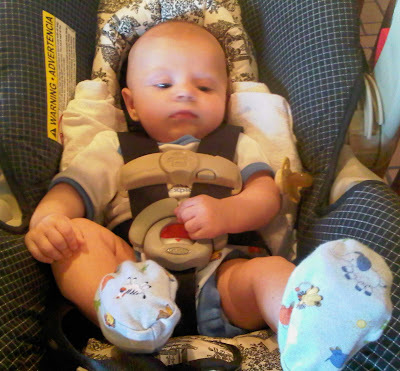 Ryan was entertained by the booties on this feet, he spent most of the meal pulling them off. Gi-gi talked Mikey into taking off all of his stickers, and putting them on his menu. 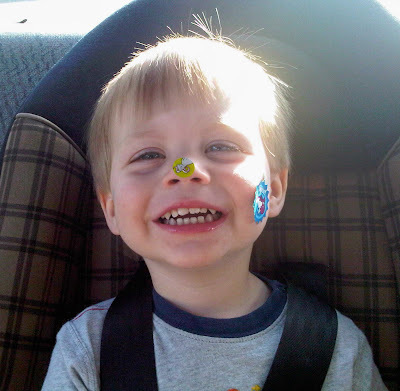 One last sticker on his cheek...thanks Gi-gi. Your wisdom never ceases to amaze me! Ryan, happy in his bouncy seat. Mikey playing with his FP Noah's Ark. He loves taking all of the animals out, and putting them back into the ark. He finally crashed in Daddy's chair, after a morning of playing with Daddy. 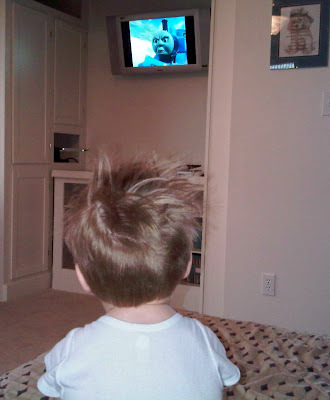 Mikey had some serious bed head this morning! 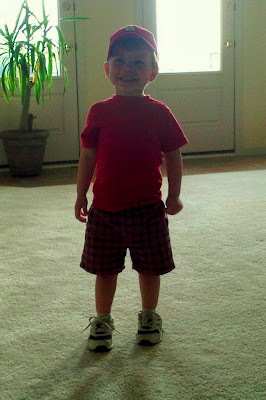 Daddy called him a "Chicken head!" Nothing a hat can't fix! Ryan was not impressed with Mikey's hat! Ryan loves his play mat and gym. He had a whole conversation with the frog. Then he tried to talk to the bird, but it wouldn't talk back.